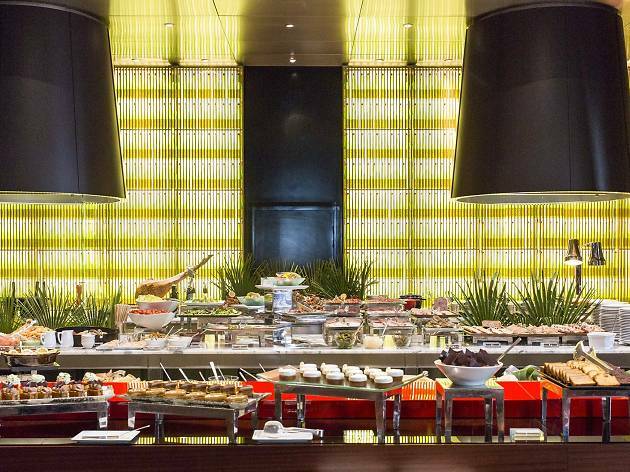 Royal Monceau’s brunch is a true culinary masterpiece. Remember the look on Charlie’s face when he sees inside Willy Wonka’s chocolate factory for the first time? Well, that’s exactly like us as we enter Royal Monceau. 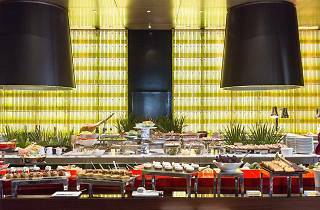 Here for their famous Sunday brunch (€126), we’re first struck by the beautiful Philippe Starck décor (modern and refined) then, and most importantly, by the gargantuan quantity of food before us: the Michelin-starred restaurant’s celebrated brunch buffet. We begin with a “Royal Booster” smoothie, bursting with chia seeds, fresh fruit and spices, followed by a selection of baked creations by Pierre Hermé (incredible viennoiseries like their famous Ispahan croissant, vanilla cake, gugelhupf kouign amann, fresh crepes and waffles), organic yogurts, fruit juices, a selection of bread and baguettes from Eric Kayser, a range of tea… if you can believe it, the list goes on. We move on to the savoury dishes, continuing our sublime culinary adventure with organic eggs, salads, fresh, Italian pasta, Lebanese dishes (cold mezze), Scottish salmon, ceviches, oysters, sushi, sashimi, charcuterie, cheese, hot dishes from the chef (burgers, the legendary club sandwich, dauphinois potatoes, sautéed potatoes). Basically, the choices are endless – so much so, we don’t even have space to go into the desserts, also by Pierre Hermé. All that’s left to say: Royal Monceau’s brunch is an absolute culinary masterpiece and the only thing holding us back from going every Sunday is our bank account.